It has been exactly twenty-one years since I was in Paris. Traveling with an orchestra, I managed a break-away and had the afternoon all to myself. I wandered the streets, looking every part the tourist, wearing the most uncomfortable shoes! In spite of my aching feet, it was extraordinary. I will always remember the art and the cafés. And to this day, my common sense is always overruled when it comes to shoes. I have a little corner in my kitchen that reminds me of Paris. Perhaps it is all the peeling and cracking paint on the nearby sunporch that evokes some sort of old-world charm, or just the rose-colored glasses I put on this morning, I am not sure which. But either way, my corner is French and it is where I go to drink my coffee. My little corner of Paris. 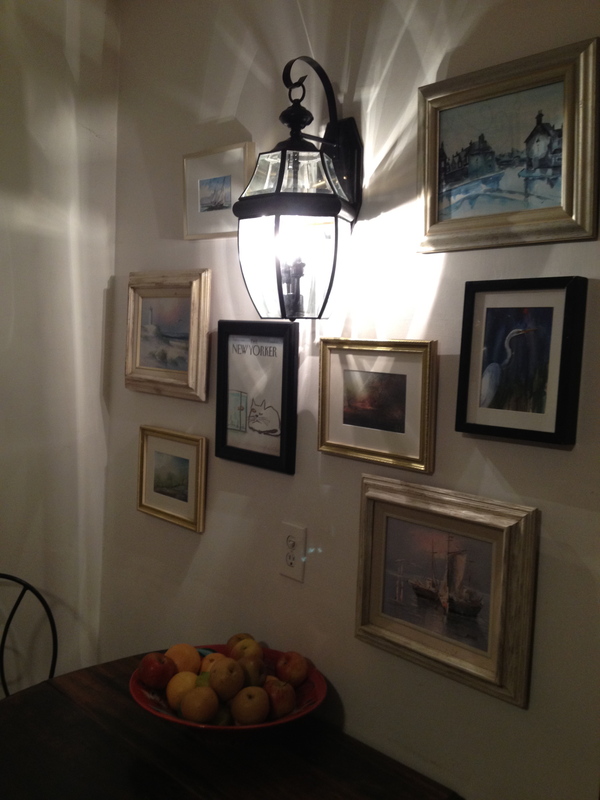 I set up the gate-leg table against the wall and replaced the sci-fi sconce with an outdoor lantern. 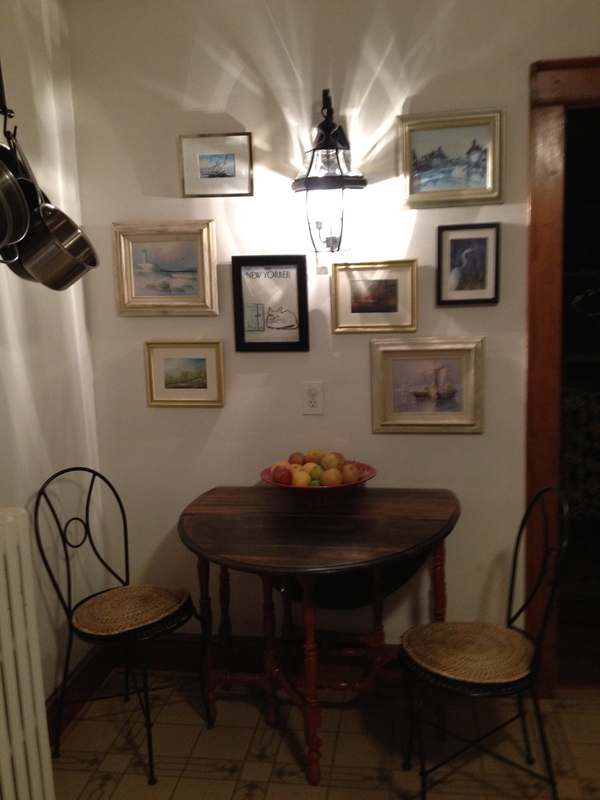 I put two chairs that I had from a bistro set with it and hung all the paintings I had collected over the years around it. Landscapes, birds, boats, you name it. The theme here was “French Country Clutter” and it works! 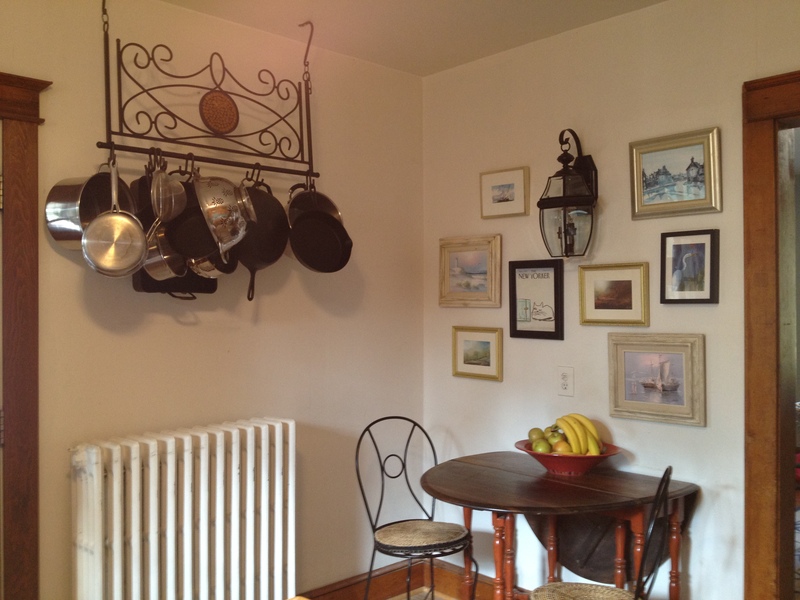 My pots are hanging on the adjacent wall and the limited amount of space you have to stand up from your chair and hit your head on a pot is definitely European. I love it! Sometimes it is nice to be short. I have to tell you about the sconce. It got a new life here in my Parisian corner when I purchased it from Community Forklift and painted it with black metal paint. 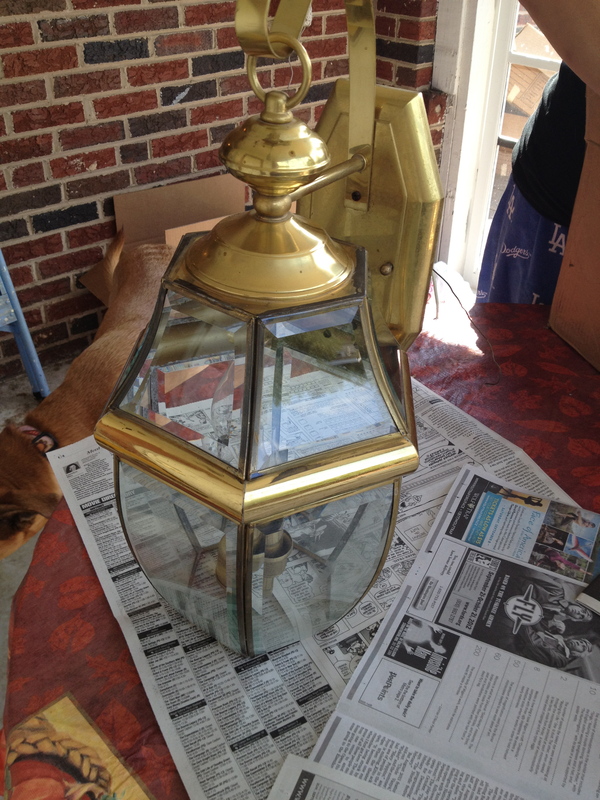 I covered up the shiny brass and now it is transformed. I still have to paint the walls in the kitchen, and renovate the rest of it, but for now I am enjoying my little corner of Paris. The living room in this house is a challenge. It was one of the reasons I hesitated about buying the house. 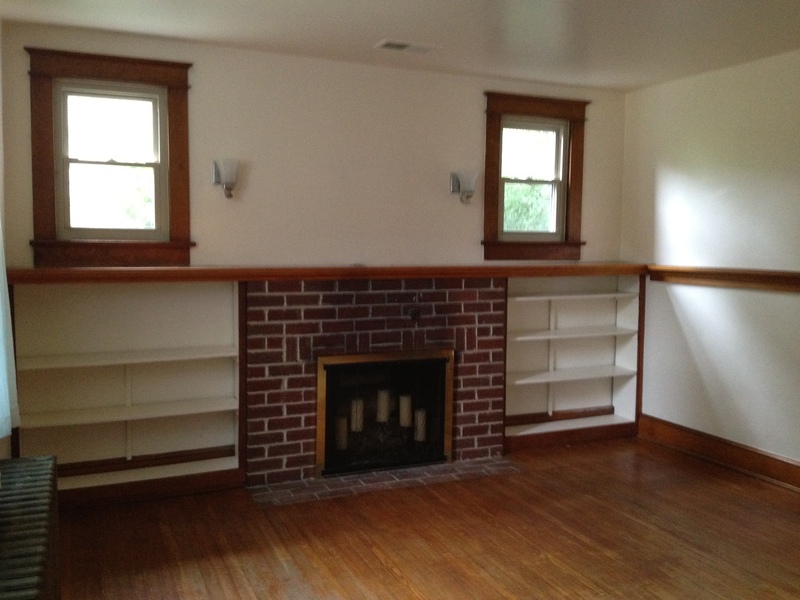 It has an awesome amount of character packed into a room that only measures 13 x 13. To quote Genie from Disney’s Aladdin, “PHENOMINAL COSMIC POWERS! …itty bitty living space”. That pretty much sums up how I feel about this living room. However, there are advantages. Think cozy and cottage and curled up with a book by the fire. Considering I grew up in a house with about 900 square feet in all, I can hardly complain. There is plenty of room for chatting and coffee and I have a few tricks up my sleeve as well. Maybe not cosmic powers like Genie, but still pretty good. 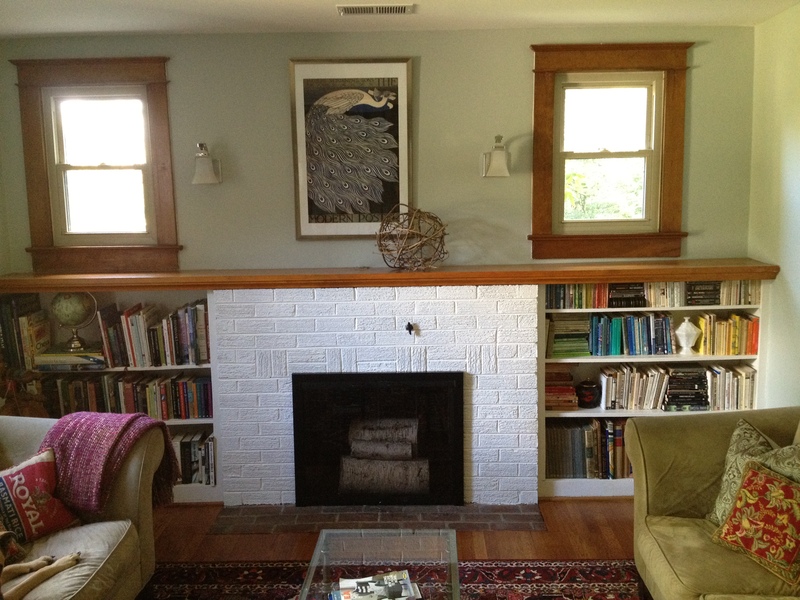 I painted the fireplace wall and bricks white for a punch of contrast and to help unify that wall. I also painted the brass around the fireplace surround black, to make it look less busy. The color on the walls is in the cool family, a trick to help them recede and not seem too close. The coffee table is glass. This is important. 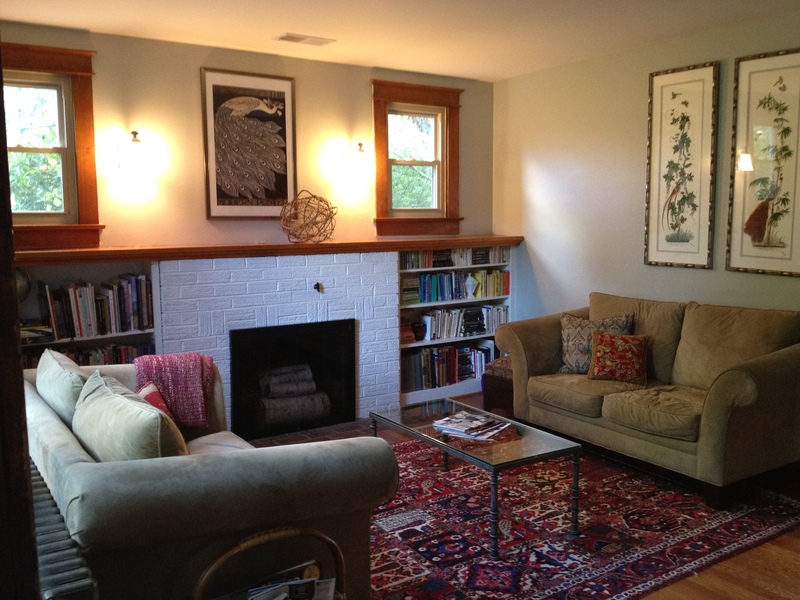 It does not occupy any visual space, which helps the room seem less cluttered. I played around with some other options, but the glass table was perfect. My crazy sis came and helped me unpack and when I realized she had reorganized the books by color, I suggested that perhaps subject might be a better way to organize the books. But she was right. The colors looked great. We had only minimal grumbling and eye-rolling from Stuart over this one and a suggested debate: Form or Function? Stuart and I are too tired chasing the baby and unpacking to debate at all, so I win. 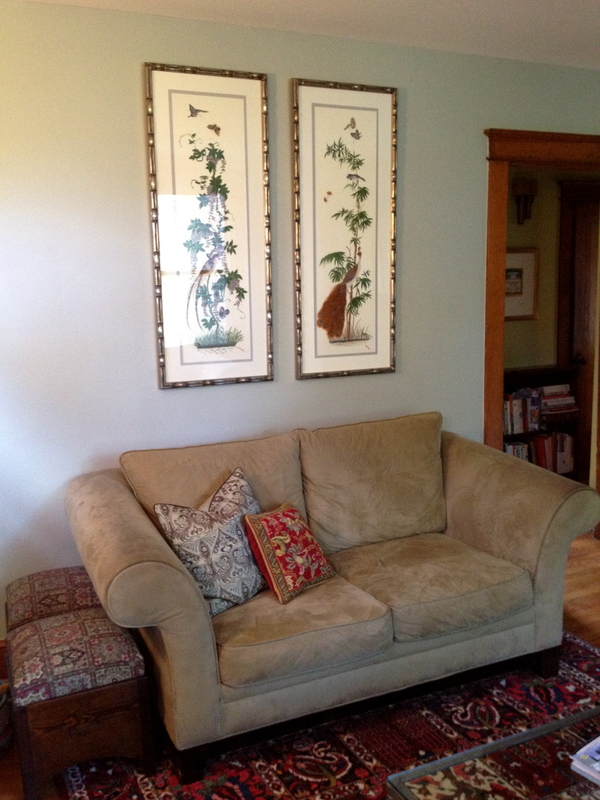 I have two ottomans tucked away next to the sofa for emergency extra seating. Very handy! 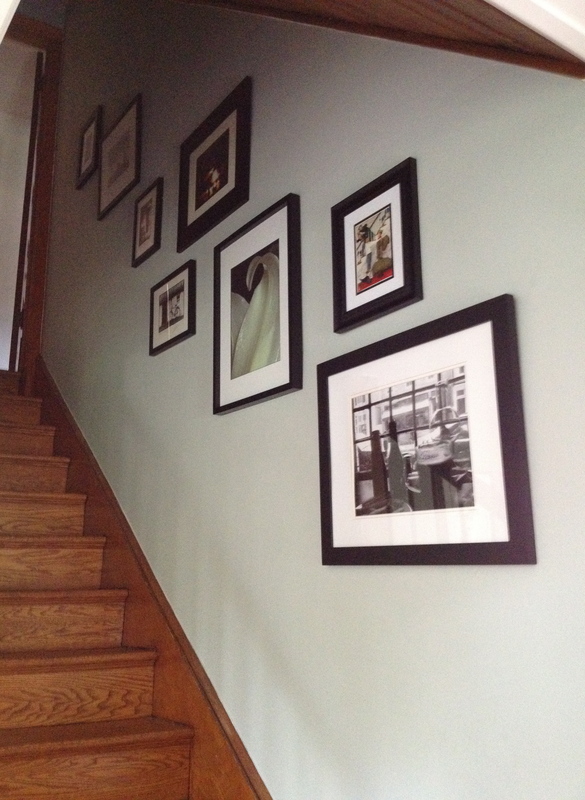 I hung my black and white photographs going up the stairwell to accent the farthest wall in the room. This helps create the illusion that the stairwell is just inside my living room, and helps it seem bigger. It also draws attention to the beauty of the staircase, which is a nice feature. Staircase Wall with Black and White Photographs. The room is not entirely done yet. I still need to hang curtains or wooden shutters over the windows that face the street. 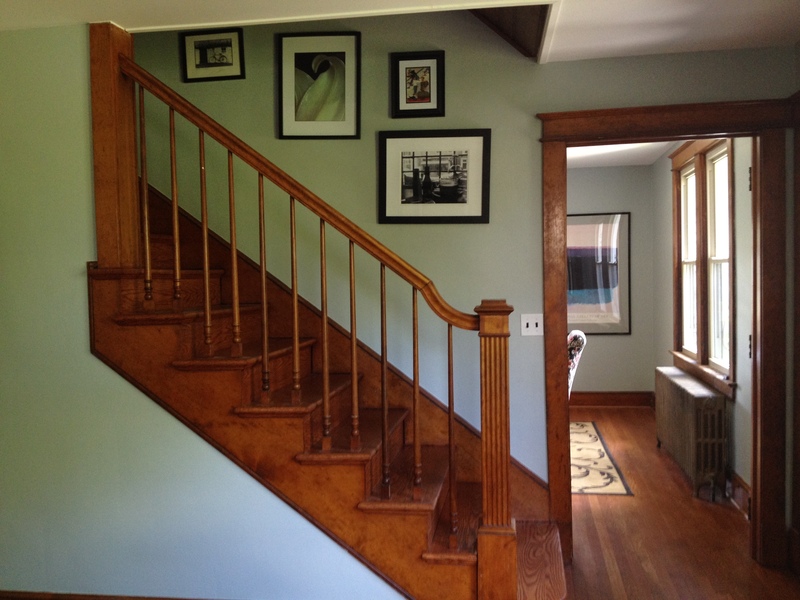 I want to install a runner going up the stairs and I am sure that the room will continue to evolve over time. But right now, it seems perfect. Mostly because it isn’t full of boxes. I’ve been thinking about recycling lately. I am trying to fit my stuff into a new house and make it look as if it was always intended for THIS space, even though it wasn’t. On a purely practical front, people cannot go out and buy new stuff every time they move. The idea of repurposing your old and tired things appeals to me; breathing new life into some old junk. Of late, my fantasies have consisted of beautiful dining room chairs prancing through my head. Once in a store, I occasionally have to wipe the drool from my chin as I ogle the chairs, until I am confronted with a price tag. Shocked, I take the reality check and walk away with nothing every time. Inevitably, this has lead to my recycling philosophy. 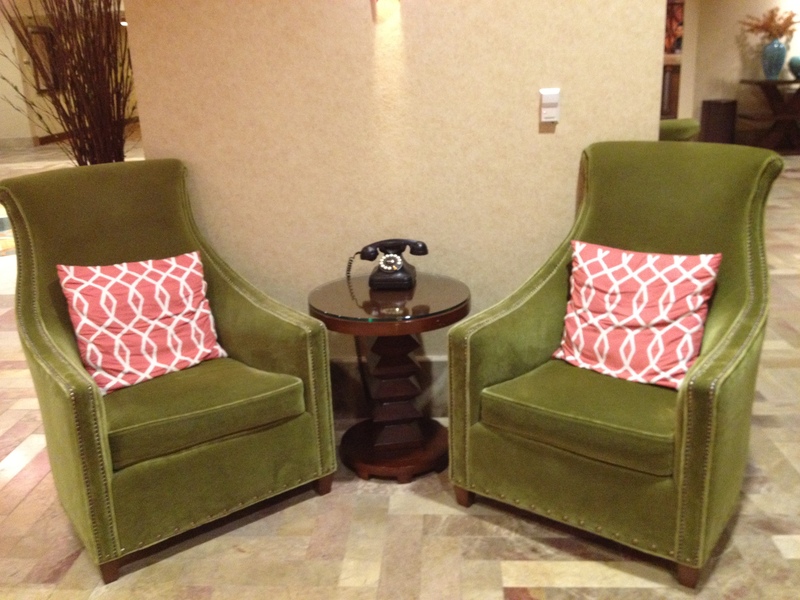 It all started with these chairs in a hotel lobby. My wicker dining room chairs have lasted for twelve years and through several children who used to pick at them when they were in time out. The chairs refuse to wear out. I wish they would so I could justify pitching them. Rather than throw out perfectly good chairs, I decided to just give the cloth chairs on the ends a face-lift with new slipcovers. This changed the look of the whole room! Slipcovered chair in my new dining room. 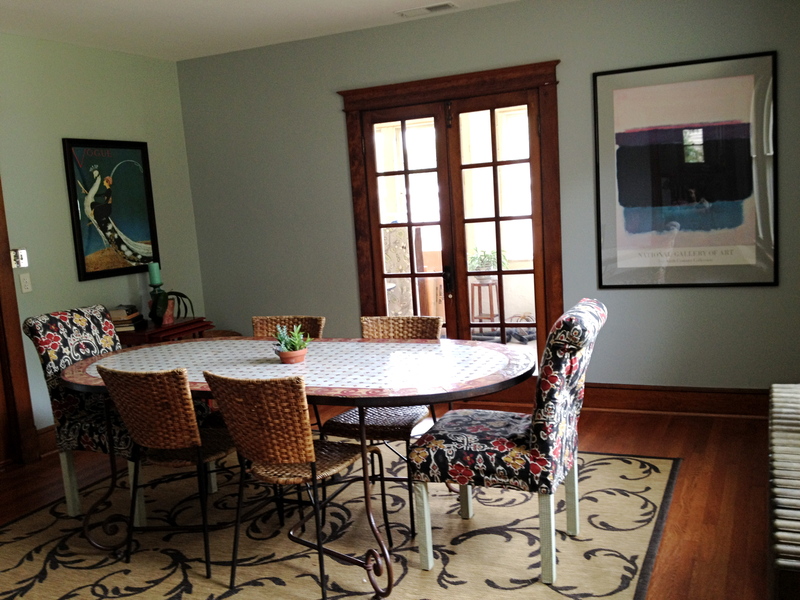 Dining room with a view of the not-yet-even-unpacked adjacent sunroom. 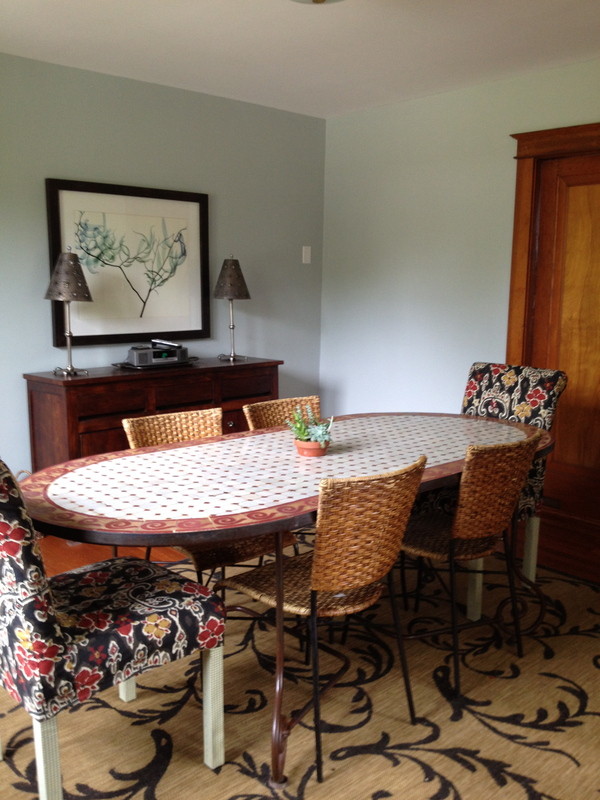 Fresh new paint in Benjamin Moore’s picnic basket gives my dining room an entirely new look. The solution turned out to be so easy. 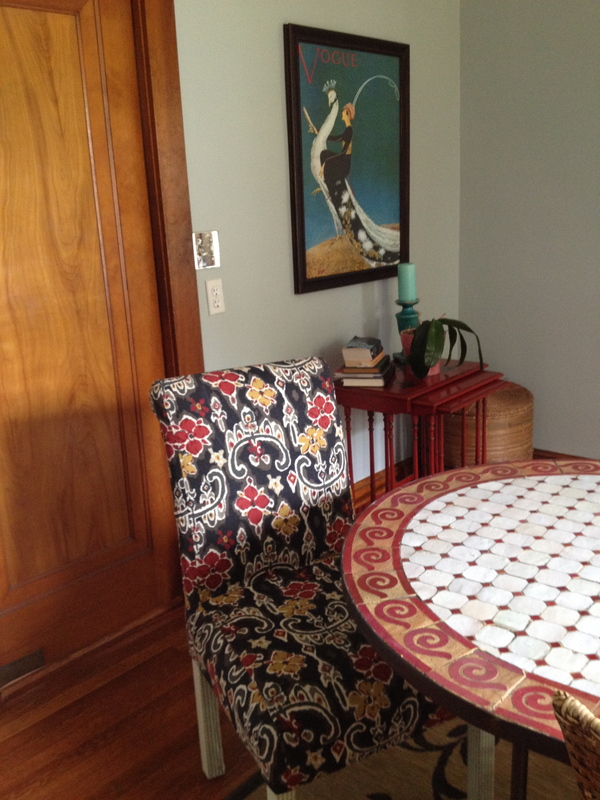 With the slipcovers from World Market, my chairs were new again in less than 15 seconds. The cost was $50 instead of at least 10 times that for new chairs. 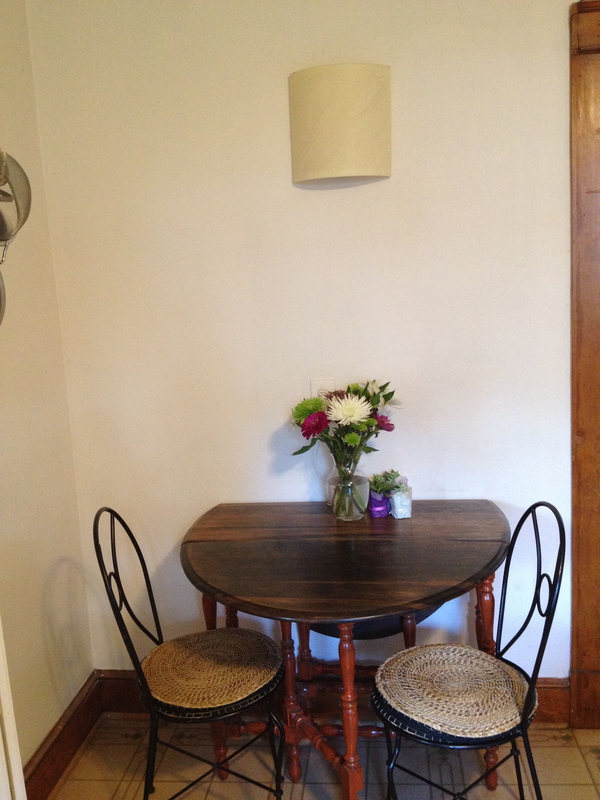 I successfully recycled the old chairs and breathed new life into them. Recycling your old things not only saves money, but can make your home unique and add personality. I am challenging myself to reuse whenever possible and if I can’t reuse what I have, buy it used from Community Forklift, Craig’s List or The Habitat ReStores. When I rescue trash, I am actually preventing it from filling up the landfill and not giving in to the constant pressures to buy more stuff. 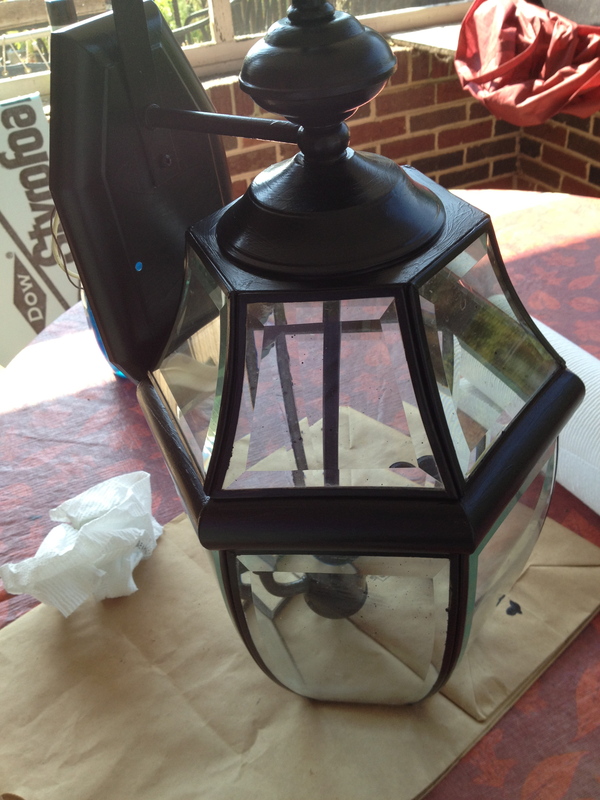 Paint your frames if the finish is wrong, paint an old light fixture to spruce it up, recover an old fabric, or just add new hardware to an old piece of furniture. If the piece is solid wood, it will last forever. These ideas are not new, but to me it is refreshing to let the house be decorated over time and not rush into the latest must-have. You will end up with an eclectic look that is interesting as well as beautiful. That is a worthy goal.